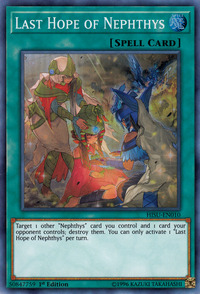 Target 1 other “Nephthys” card you control and 1 card your opponent controls; destroy them. You can only activate 1 “Last Hope of Nephthys” per turn. Matriarch of Nephthys, Disciple of Nephthys, Devotee of Nephthys, and Cerulean Sacred Phoenix of Nephthys appeared in this card's artwork.